This is the granddaddy of all summer movies, which seems strange since I am including five years worth of summer movies on this blog before this ever came out. How can a movie that is younger than all the summers before it be considered the granddaddy of summer movies? The answer is simple. JAWS re-framed the way we viewed movies, all movies, but especially summer movies. 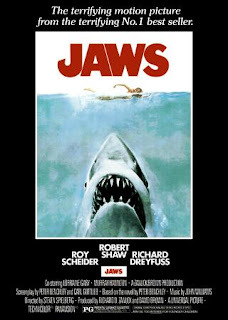 JAWS is the standard that we will use to make comparisons of our film experiences and impressions. It is the prism through which we see our own history. Those of us who lived through the phenomena that was and is JAWS, can never look back without thinking how it changed us. Those who came after, can never live in a world where JAWS did not influence the way movies are made and marketed. Any one who lived before JAWS, knows how it changed the movie world, and looking back on summer movies will be a nostalgia of a different order because JAWS is in your world now. Some might think that this is hyperbole but the number of films, filmmakers, academics, marketers, and film-goers, who have been influenced by this movie is undeniable. I have actually read on line comments that dismiss JAWS and suggest it is somehow just a footnote in film making history. If editing is a footnote, if the addition of sound and color to films are footnotes, if the study of film as an artistic medium is a footnote, then maybe they are right. (BUT THEY ARE NOT!!!) The combination of story, director, script, acting and especially marketing created the modern world of film. There may be some negative consequences (like Shrek 4 opening on 4000 screens), but the variety of stories and film-making that have resulted from JAWS is just undeniable. This is the gold standard. I saw JAWS on opening day in the Summer of 1975, with my friend Dan Hasegawa. We went without Art that day because he was taking a girl to a different movie. Dan and I went to the Hasting's Ranch Theaters, three moderately sized screens located just north of the big Pacific Theater Hasting's Theater. We knew next to nothing about the film except what was shown in the trailer. The trailer gives you a good impression of the action and adventure that is coming your way, but I think it undersells the horror aspect and that is what we were most surprised about. From the beginning cello strokes and underwater POV shot, we are creep-ed out. It still did not prepare us for the intense opening sequence that everybody held their breath through. Later in the movie, I literally saw 500 people sink into their seats in dread and then jump out of the seat,simultaneously. I am not exaggerating, the audience levitated at least a foot out of their seats when Ben Gardner appears. There have been gotcha moments in films for years; Alan Arkin's dying leap for a blind Audrey Hepburn or Carrie grabbing poor Amy Irvings arm, are those kinds of jumps. This made them all look quaint by comparison. I had seen the Exorcist a couple of years earlier, after it had been talked about and described to me for months. It was still frightening and made me jump, but that was despite what I knew was coming. Here, we did not know what was going to happen, and after that first scene it seemed like anything was possible. Amanda has seen this movie maybe more than other movie in her life and she still covers her eyes for a few scenes. The movie is so much more than a horror film however. This is a struggle of a family man to cope with the inadequacies that plague him, it is the story of a place that defines itself as a paradise, suddenly being stripped of it's self concept. Most of all, it is the story of a quest by an Ahab like character for vengeance against the monsters that have defined him for the thirty years since his own encounter with the Great White Whale. Quint is the greatest movie character ever prior to 1980. He is memorable for his tics,and dialogue and the performance of a great actor who's work in this movie was not properly recognized by any critics groups of the time. If you were to ask people, what great supporting actor role performance they remember from any time in the 1970's Robert Shaw in JAWS will be mentioned. I'll bet that none of the five other actors nominated for Academy Awards that year would make the top fifty mentions on that standard. The monologue that Quint delivers on the Orca, about the U.S.S. Indianapolis is without a doubt one of the greatest scenes in movie history. It stands beside Micheal's kiss in Godfather Part 2, Kane's rage in Citizen Kane, and even the Airport scene in Casablanca. Robert Shaw re-wrote the dialog for himself, and his delivery, starting off with a self knowing smirk, transforming to a terrified memory and finishing off with a self-deluding smile and bit of panache is something I would imagine every actor now looks at with awe. I am not an expert on performance, but this whole scene seemed real, every bit of it, and it was created by the film makers. There are a hundred things about this movie that people should look for or notice when they watch it. Sometimes it is a bit of comic dialog delivered by a character that has a single line; it might be the framing of a shot that makes key information jump out without writing a big sign to signify it; maybe you should be watching the clever way that the shark is hinted at, without being shown or the wondrous shooting stars in the night time scenes on the Orca. I just watched this movie for what is probably the tenth time in the last year (including two big screen theater screenings) and I found something new about the main character. He is new at wearing glasses. It is hinted at, spoken of but never obvious, and I just got it today. Of course my kids will say I am not all the observant to begin with, just ask them about the tires in the trees if you want their insight. What kind of movie is it when you can watch it dozens of times, still be sucked in and find something new every time you watch it? I'll tell you what kind of movie it is, PERFECT! Richard, it's so easy and so relevant for so many to praise and appreciate JAWS simply for it's place in the history of cinema. However, when one can read the insights and memories of someone who was actually THERE when the film opened and experienced the sensation it caused first hand, it makes JAWS so much more worthy not only in film history, but for those who truly remember it. Keep the thoughts alive! Love this write-up, Richard. It's also great to know someone else that was there, like I was, through it all in '75 (my experience occurring at Century City). Interesting to read saw it at the Hastings Ranch Theaters. I have my own distinct memory for that same place, but for a entirely different film.